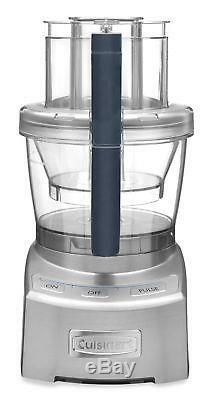 Cuisinart FP-12DCN Elite Collection 2.0 12-Cup Food Processor, Die Cast. Includes 12-cup large bowl and 4-cup small bowl with pour spouts & measurement Markings. Electronic touchpad controls - On/Off/Pulse with blue LED lights. Includes adjustable slicing disc (1-6mm), adjustable shredding disc (fine/medium), large and small chopping/mixing blades, and a dough blade. The Cuisinart Elite Collection 2.0 12-cup Food Processor combines the Cuisinart tradition of culinary excellence with groundbreaking innovation. A 4-cup work bowl nested inside the big bowl, along with the adjustable slicing disc and reversible shredding disc, provide home chefs with multiple food processors in one! The control panel has been redesigned and the exclusive Seal Tight Advantage System has been simplified to deliver maximum bowl capacity, plus clean processing and pouring. It is truly the finest food prep appliance around for today's modern kitchen. 11.5 x 13.25 x 18.75 inches. The item "Cuisinart FP-12DCN Elite Collection 2.0 12-Cup Food Processor, Die Cast" is in sale since Monday, February 5, 2018. This item is in the category "Home & Garden\Kitchen, Dining & Bar\Small Kitchen Appliances\Food Processors". The seller is "aticharkraiphonsa_0" and is located in US. This item can be shipped to United States.